Summary: Sophie’s got used to being the girlfriend of Billy Buskin, the biggest movie star in the world. Sort of. But when she and Billy take a trip to visit his family in Los Angeles, she quickly discovers she’s totally unprepared for the chaos of Hollywood, the paparazzi and Billy’s controlling mother. And when Billy extends his stay in LA, leaving Sophie to fly home to Rosefont Hill alone, it seems there’s more than just miles between them. Now Sophie must decide if they can overcome their differences for good. Because not every love story lasts the distance . . . Always With Love has been one of my most (if not the most) anticipated novels of 2016 for me. I’m in love with Giovanna’s stories and the way she tells these tales of real people in real situations. You simply cannot help but love her writing style. Billy and Me is the story of Sophie and Billy, an unlikely couple after a chance meeting in a small village in Kent. Now that Billy is back to acting and Sophie is running ‘Molly’s-On-The-Hill’ Always With Love shares their story as they try to keep their love going over an incredible distance. I’ve been so excited to get back in to the world of Billy and Sophie after the first novel and novella staring them, they are the perfect guilty pleasure couple to read about. The new tale in their series definitely did not disappoint for me. It was filled with funny one liners which make you laugh out loud, loveable characters and just enough fluffy to make you grin like the cheshire cat. One of the big things that i’ve noticed about Always With Love is the dramatic improvement in Giovanna’s writing. There were a few moments i felt like i was getting repeated information, but that wasn’t enough to put me off. The writing is different to Billy and Me (which i finished a few days previous to starting Always With Love) and just has generally improved so much. I could not help but feel a sense of pride as i was reading at my favourite authors improvements. Also Giovanna always adds an element to her writing that makes it stand out. This time it was the letter exchanges between Sophie and Billy that made my heart clench that little bit more. It was a lovely touch to dive deeper in to their thoughts about each other. Once again Giovanna provided incredible characters that are loveable and easy to connect with. Sophie and Billy had me sucked in from the start and believing every word that left their mouths. But this new novel brought new characters with the clan of Buskin’s. Lauren was a particular favourite of mine, but i just wished we’d have gotten more of Jay in the novel (Billy’s little brother) as i would have loved to explore his personality more. I feel such a connection to these characters, it almost feels as if i know them. Giovanna truly brings them to life. I’m a little lost now as I wait for Giovanna to think up her next stories from either Billy and Sophie or completely new characters (although I am hoping for more from this series) as I always highly anticipate her novels. They’re fully of happy moments that will make you beam at the story, or moments that make you cry along with the characters. The perfect combination for an easy going chick-lit read. 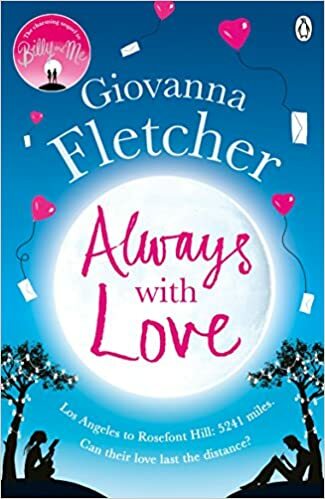 Always With Love is the perfect instalment to Billy and Sophie’s lives and i’m really hoping it continues on from the cliffhanger it was left on. I cannot recommend this novel enough. Get your fix of Billy and Sophie by clicking these links!